Not only sea. 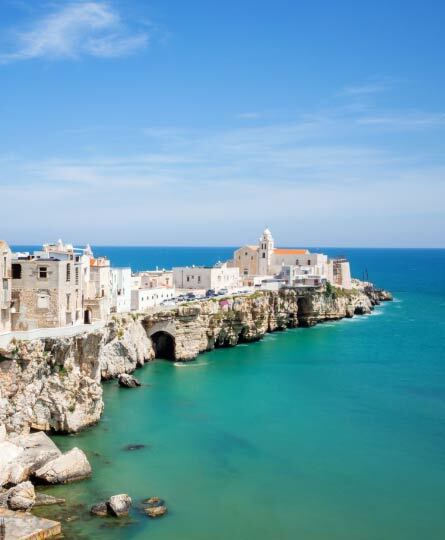 The Gargano is a land capable of making you fall in love with the crystal blue of its waters and its luxuriant nature, but in addition to the beach life, this area can offer much more. 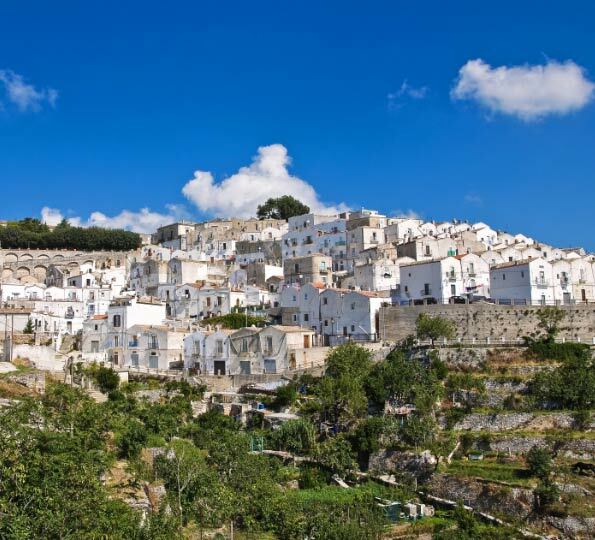 In the surroundings of our hotel there are many other things to do and to see: discover with us what to see in Vieste, in the Tremiti Islands and in the Gargano National Park. 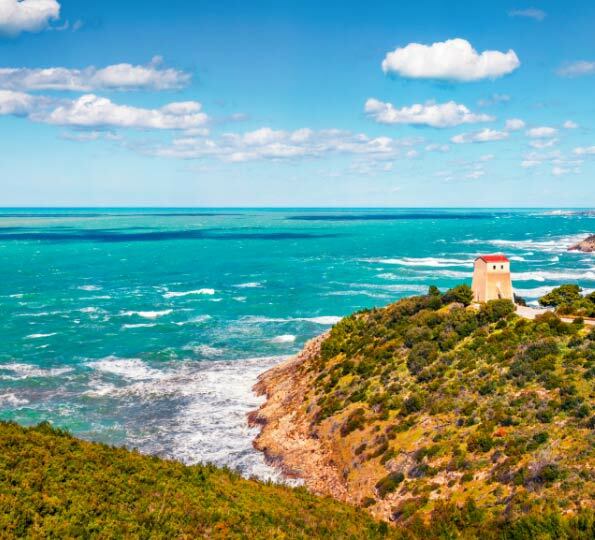 This is one of the most famous symbols of the Gargano in the world and is located just 12 km from Vieste. Originated in the calcareous rock typical of the Gargano by the millenarian erosion of the sea and by atmospheric agents, according to legend it was formed by the Nymphs in honour of Neptune, the God of the sea. In proximity of the sheer cliff from which the castle of Vieste dominates the landscape, it is possible to see an imposing monolith in calcareous stone. This is the famous "Pizzomunno", which gives the name to that beach and which has given life to various legends. 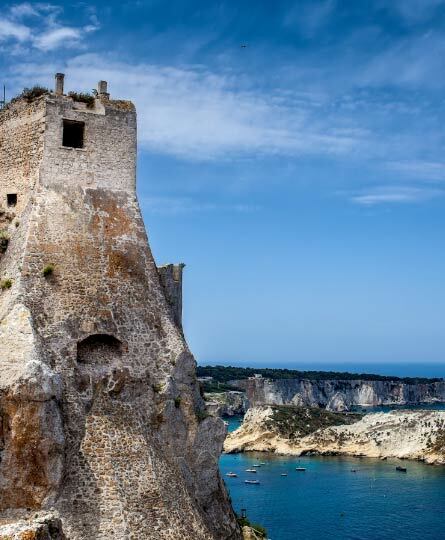 Among the many coastal towers of the Gargano, Porto Greco stands out for its beauty and its conservation status. It can be admired not far from Vieste, following the road that leads to Mattinata. The tower marks the entrance to the homonymous clear pebble beach, which overlooks the sparkling sea of Porto Greco. The historic centre of Vieste tells the history of the village well before its tourist life. It tells the fear of looting, the difficulties of fishing. The narrow and winding small streets make us understand how it was important to have the possibility to hide and flee from the Saracens, the mediaeval arches open the view over small hamlets, where once upon a time artisan workshops were flourishing. Evocative squares as Ripa or Piazzetta Petrone, are the ideal frame for photographs to remember for a long time. Noteworthy in the village, also the presence of the Malacological Museum, the right place where you can learn about shells and Vieste sea life. In addition to the emotion of visiting an archipelago of islands and to the historical interests linked to the Abbey on the Island of San Nicola (Sanctuary of Santa Maria a Mare), the Tremiti Islands are able to impress even the most expert connoisseur of the sea with their regions of rare beauty, where the crystalline blue of the sea beautifully contrasts with the white calcareous rocks. The Blue Flag assigned to the sea of the Tremiti Islands demonstrates this great beauty. Dolines. The karst nature of the territory has generated in the course of the years many collapses of the upper walls of the caves, leaving behind big basins in which the vegetation grew. Inside the park you can see the biggest dolina in Europe, The Dolina Pozzatina. The Lakes. In the north-western part of the park you can visit two unusual lakes, the lake of Lesina and Varano. Wild orchids. In Gargano is located one of the highest European concentrations of orchids, that every spring calls fans and visitors from every part of the world. The Foresta Umbra (from the Latin cupa, shady), is located at about 800 meters in height, with 400 hectares extension, inside the National Park of Gargano. A protected area characterized by a very rich flora and fauna. Here you can find rates, foxes, wild boar, squirrels, roe deer, peaks and much more! 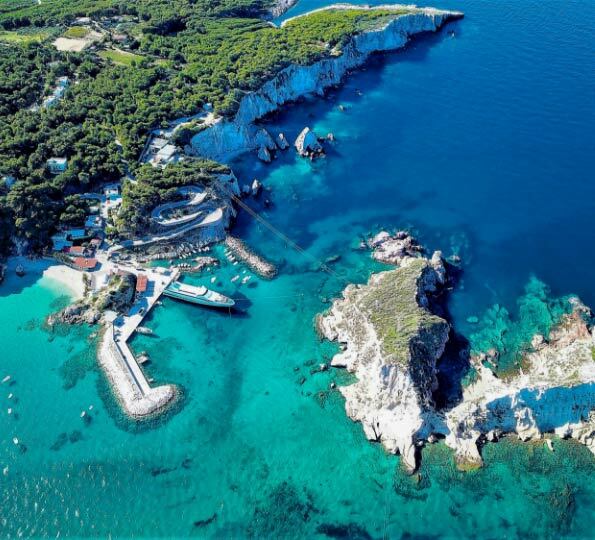 In the tract of cost that after the Architiello of San Felice goes towards Mattinata, nature enjoyed drawing, with his patient work of erosion, some stunning coves in the limestone rock and many sea caves, some of which can be visited during an excursion by boat. 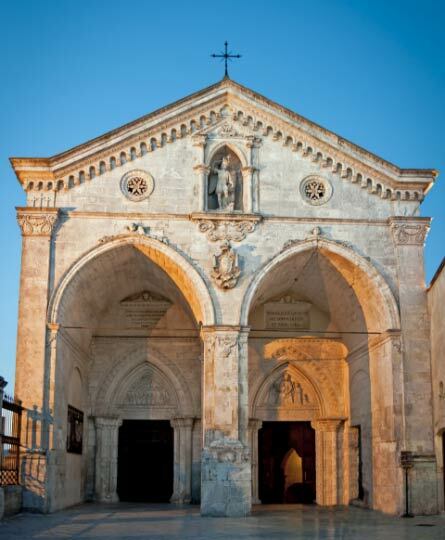 Monte Sant'Angelo is since centuries a popular destination for religious pilgrimages, considering that here, at the end of the V century, according to the narration, the Archangel Michael appeared in a vision to the bishop of Siponto, Lorenzo Maiorano. From that moment, the fame of the sanctuary of Monte Sant'Angelo started and grew over the centuries, becoming a vital point of reference for many faithful. The Feast of San Michele Arcangelo from 28 to 30 September every year is followed by thousands of people from every part of the world. 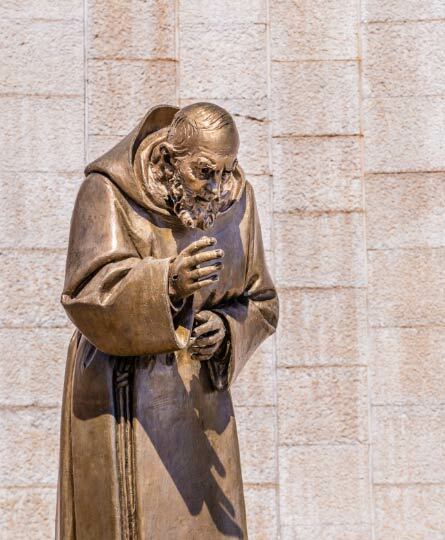 At about 25 km from Monte Sant'Angelo, there is another unmissable landmark for religious tourism in Puglia: San Giovanni Rotondo, where is located the church of St. Pio of Pietrelcina. The fame of the village is linked to the complex of the Church of Santa Maria delle Grazie and to the adjacent monastery where Padre Pio stayed for many years. In 2004 was inaugurated the Sanctuary of Saint Pio of Pietrelcina, a great church designed by Renzo Piano and built in 10 years of work, capable to contain something like 7,000 faithful.